So many people have enjoyed my little Christmas tree this year, so I thought I would create a step by step tutorial for you. This is the second tree I’ve made so far. In December I will post a picture of the very first one. I will also be helping a friend make one, so I might post that one too! 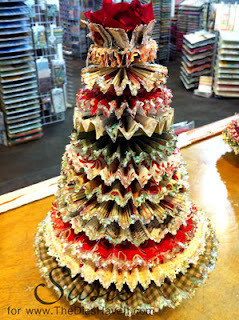 This tree is at my local scrapbook store, The Crafty Scrapper. There are printed copies of this tutorial there also. If you are in the neighborhood, stop by because not only will you see my tree, you will be in the best scrapbook store on earth. Using a scoring board, score six coordinating 12x12 patterned papers at ½” intervals. From your scored papers cut strips of paper with the following dimensions. For strips longer than 12” you will tape them together once cut. If you want fancy edges, this is the time to use an edge punch or decorative scissors on one edge of each paper. Use ScorTape to attach the ends of each scored strip. You will now have the start of a rosette. Flatten the shape and attach a punched cardstock circle on each side using hot glue. If you want a little space between layers, you can add a chipboard circle on top of the cardstock one. Continue this same process for all twelve layers. Stack layers using hot glue. For the topper, do not flatten your final rosette. Adhere it to the top standing up. Add a flower or ornament or star to the inside of the topper. Add Stickles or glue and glitter or mica flakes to each layer. Attach a base to the bottom of your tree. Be creative. You can use a votive holder, a ribbon spool or any number of found items for the base. I was inspired to make this tree by both The Gentleman Crafter and the Archiver’s Blog. It is not my original concept, but an adaptation. I give credit to both originators for the concept. If you have enjoyed this project, please visit my blog daily for more inspiration. I hope you will make one of your own. It is super fun and you will be the envy of all your friends! Awesome! I am SO tempted to make one of these!